Photo: Students write notes to commemorate their attendance at NIYC. 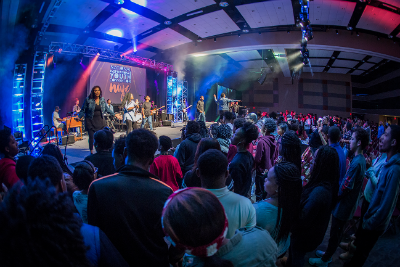 The National Inspirational Youth Convention (NIYC) recently concluded its annual conference, attracting nearly a thousand attendees. Speakers and delegates met in northern Kentucky at the end of December 2016, marking the first time the convention has been to Kentucky. Conference facilitators included several Church of God pastors and leaders, such as Leo Robinson II (Holbrook Avenue Church of God, Flint, Michigan), Kimberly Barnes (Arlington Church of God, Akron, Ohio), David Sebastian (Anderson University School of Theology), and Andy Stephenson (Church of God Ministries). Pastor Monté Dillard (First Church of God Christian Life Center, Evanston, Illinois) and Minister Janae Pitts-Murdock (New Direction Christian Church) were among a powerful roster of speakers which included Pastor Reginald Sharpe (Decatur, GA), campus pastor at the House of Hope Macon, under Dr. E. Dewey Smith Jr. Highlights of the conference included statements from students who endured some challenges during the year, but testified to the keeping power of Jesus. When speaker Amy Williams addressed the topic of brokenness in her sermon, the presence of God was so strong that students lingered in the ballroom as youth leaders and pastors joined them in prayer. As the convention wrapped up on Friday, December 30, delegates flooded social media posting selfies and statements of life-change using the hashtag #NIYC2016. 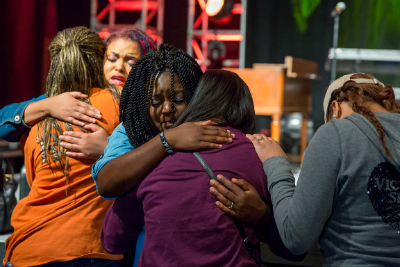 Photo: Powerful moments were plentiful at NIYC 2016. 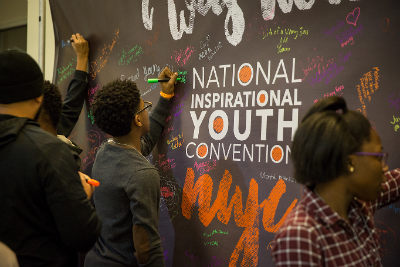 This year, the NIYC will take place December 27–31, 2017, at the Statehouse Convention Center in Little Rock, Arkansas. For more information, visit www.niyc.org. This entry was posted in All Church of God, Youth Ministries and tagged conference, families, family ministry, Kevin Earley, NACOG, National Association of the Church of God, National Inspirational Youth Convention, NIYC, NIYC2016, northern Kentucky, Precious Earley, students, unity, youth. Bookmark the permalink.